First outing with the complete nappy system was very successful. Everything kept inside, easy for me to clean afterwards. Just worked out for my one purchase of Happy Nappy, Nappy Wrap and liners I will get 25 swims for 57pence each. Next time round I will only have to buy another pack of liners. Happy bank balance and I can feel good too knowing I have done something towards my Green New Year resolutions. This combined with the biodegradable nappy liner has given me confidence to tackle trips to the swimming pool by myself. I think I would have struggled with washing out the contents of a reusable nappy as well as getting my son dry and dressed. These lovely soft white cotton nappy wraps are embroidered with the Splash About logo. These nappy wraps form part of the fantastic new and environmentally friendly Splash About nappy system. 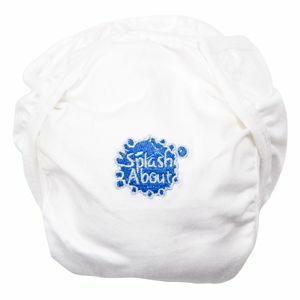 Though the Splash About Swim Nappy works perfectly well alone, it's even easier to clean when a liner is used inside. Therefore, we've developed a system to save you money and protect the environment. Soft white cotton nappy wraps are embroidered with the Splash About logo.